Pictured, from left, front row, Evan Scott, Ollie Plikerd, Sully Moore, Jace Curry, Cole Cline, Victor Blanco, Cole Christner, Trent Ritter and Eivynn Woolums; Back row, from left, Den Leader Trevor Ritter, Cub Master Don Curry and Den Leader Jeremy Curry. 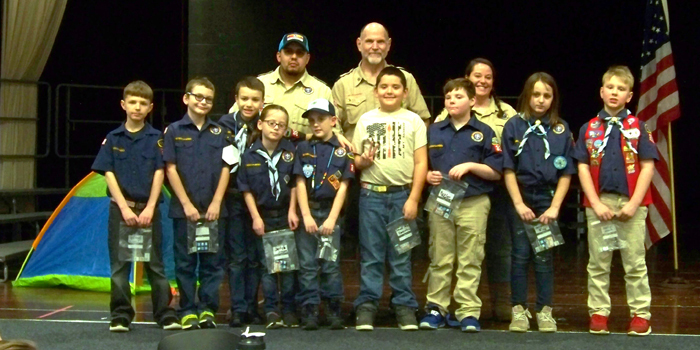 SYRACUSE — Syracuse Cub Scout Pack #3828 hosted its annual Blue and Gold Banquet Monday evening, Feb. 11, at Wawasee Middle School which was attended by family and friends. 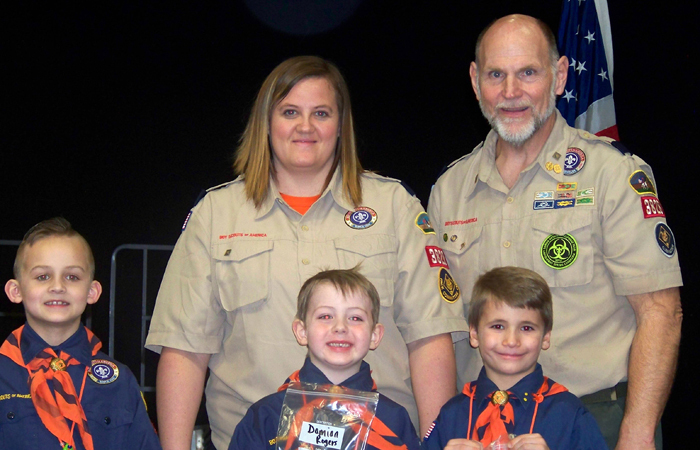 Cub Scout Master Don Curry handed out a total of 280 awards to the pack’s 32 cub scouts. Pictured, from left, front row, Bentley Truman, Kody Stanley, Alpoe Walker, Jadyn Jensen, David Cline, Alex Gonzalez, Deklan Hawthorne, Skeyelar King and Dalton Moore. 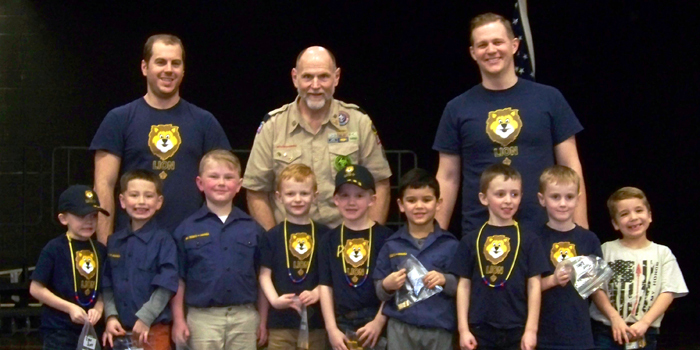 Back row, from left, Den Leader Santiago Gonzales, Cub Master Don Curry and Den Leader Kim Jensen. 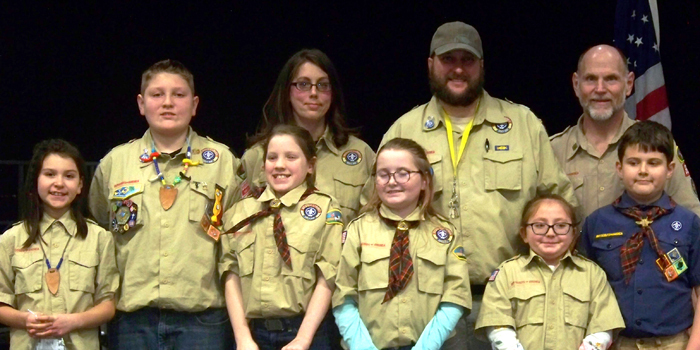 Pictured, from left, front row: Gavin Devanathan, Damian Rogers and Chance Woolums; Back row, from left, Den Leader Stephani Cline and Cub Master Don Curry. Pictured, from left, front row, Evalyn Blanco, Nolan Dailey, Sophia Davis, Haley Maynus, Maddie Plikerd and Maddux Ringler. Back row, from left, Dean Leaders Brandi Dailey, Travis Dailey and Cub Master Don Curry. 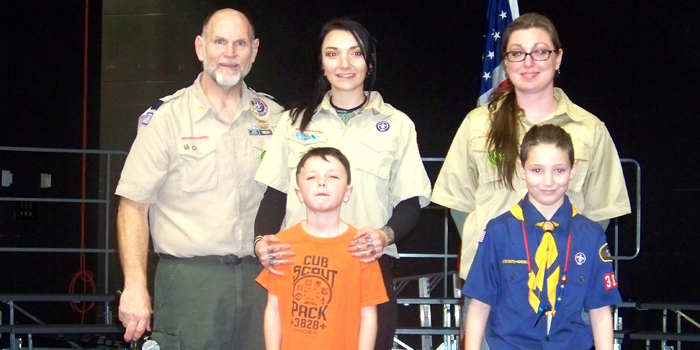 Pictured, from left, front row: Brogan Rich and Vincent Halferty; Back row, from left, Cub Master Don Curry and Den Leaders Brittany Bushong and Kim Halferty.